For the third time since 1989, Bulgarian voters have inflicted a massive "no" to their political class. The GERB party (a Bulgarian language shortcut for "Citizens for an European Development of Bulgaria") got 116 of the available 240 seats in the one-cameral parliament of Sofia. Their nearly 40% of the more than 60% vote, propelled the vociferous major of the capital Sofia, Boiko Borissof, into the seat of prime minister. At the European elections of last month it was already impossible to deny, that Borissovs party was going to carry the national elections, scheduled for July 5. The high level of participation in the election helped to justify the GERB victory, in spite of frequent vote-buying, an ethnic Turkish vote and "election tourism" on an unprecented scale. In 1990, Bulgarian voters chased the historic Todor Zhivkov gerontocracy. In 2001, they invested their hopes in the former king Simeon. Every time, they were disappointed. Will the Borissov landslide of 2009 be their ultimate revenge? Will the third Bulgarian electoral revolution finally bring peace and progress? and how the European Union could catch the opportunities for itself and for the Bulgarian people. In the second half of the 19th century, a seemingly unimportant province of the Ottoman empire woke up. The decline of the Ottoman Empire was certainly of much help. But the emancipation of inhabitants of remote villages, of virtual serfs to absenteist Turkish landowners and of artisans working in the few cities that existed, could not have been imagined without the intervention of an European educated elite of former university students and freemasons. Like the 18th century enlightened intellectuals in France and elsewhere, they concentrated on popular education. It is by force of that drive, that a new Bulgarian nation came into existence on the vague memories of mediaeval culture. It was a very real Renaissance. The Bulgarian Renaissance. The European big powers of the epoch adopted a double approach. Insofar as the Bulgarian upheaval weakened the Turkish "sick man", they were helpful. But when the Bulgarian independence threatened to offer an entrance to the Mediterranean to the Russian Czars, they blocked. Bulgarian independence was OK, as long as it did not hinder Austrian plans with Serbia, Bosnia and Macedonia. It should not endanger Greek ambitions in the Northern Aegean either. The Balkan Wars of the early Twentieth century learned a disappointing lesson to upcoming Bulgaria. That explains why the country choose the wrong side at the start of the two great wars. Bulgaria was confined from the South by Greece, from the East by Turkey, from the West by Serbia and from the North by Rumania. In spite of all that, the country thrived between the two wars. Its natural resources helped very much to keep international crisis and depression away. Until about the year 1940, a national entity with half a century of independence, existed. But its existence was fragile: Wrong choices and geopolitical compromises (Yalta, 1944) changed its destination and brought it under Soviet dominance until 1990. I spoke with a young woman student, at the start of this year. She won a grade in classical philosophy at Sofia University. I told her, that I was confident, that out of the actual mess of Bulgarian culture, something new and vigourous would develop. But she cut me short. She explained to me, examples at hand, that the nearly half a century cultural desert and all the repression that went with it, killed any hope for creativity and free intellectual life. I was dumbfounded. Who am I, to deny the artistic and cultural disaster that manifests itself daily in Bulgarian television, in the shows of the unexplainable Aziz? Of course: The classic treasures of Greek and Roman civilization are being preserved. Precious artisanship survives in the valleys of the Balkan mountains. The Rila monasteries receive hundreds of visitors a day. But where is the young generation of artists, writers and thinkers one should expect to havAe established itself after the Big Change of 1990? I had to admit: It is not there. How could the energy, the unexploited energy, come back and manifest itself? The only workable solution, I see, is a new cross-fertilization with Europe. Like hundred, two hundred years ago. Engish, French and German cultural missions do still exist. French secundary education in a number of cities, has survived the Soviet era. The Borissov program suggests an intensification of those exchanges. Europe has to decide. Leave them alone, let the Americans do their thing, or redevelop and intensify cultural and educational exchange. It is urgent. Cultural void means negative perception of minority cultures. In the Bulgarian case, that means: suppression of Roma and Turkish identities. Europe should help Bulgarians to get confidence again in their own culture. That is a precondition for respect of others. When you feel safe, you do not envy others. Bulgaria is a rich country. Without the riches in agriculture and men, Alexander the Great, in the fourth century before Christ, could not have spread Hellenism in the East. He came from the City of his father Philip, Philippople, the actual Plovdiv. At the end of the First century, Trajanus, the Roman emperor, would not have built a road from the Mediterranean to Dacia, if the environment wouldn't have been safe and abundant. Bulgaria is potentially a great crossroad between the East and the West, and: between the North and the South. The East-West connection is the first to have been reestablished. Turkish trailers circulate by the hundreds between West and East. The EU helps with road construction, but has frozen its subsidies because of Bulgarian maffiose dealings with contracts. The new government wishes to end this and reclaim imediately the lost money. Iaccompanied by hundreds of Turkish and other trailerst is very important. On the road between Istanbul and Budapest, I am accompanied by hundreds of Turkish and other trailers. We loose many hours in queues and with burocratic rules. The North-South links are virtually non-existant. 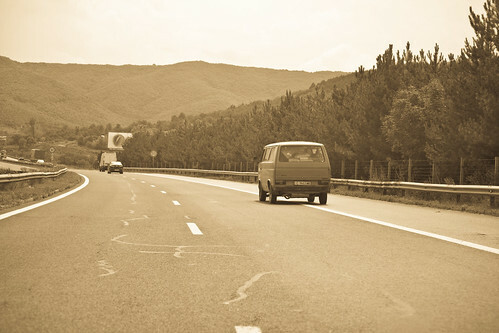 It is true, that you can go by modern road from Thessaloniki to Sofia. But what next? A good road that connects northern Greece via the Rhodopes Mountains through central Thrakia with the Balkan throughways ti the danube valley and Rumenia is only vaguely under construction. However, its strategic role is evident: Avoid the Dardanelles and arrive directly in the Ukraine, in the Krim, etc. 4. How to engage the new Bulgarian leadership? A regional strategy, alas, is not an EU priority. The USA established a giant military base in Blagoevgrad, next to the Greek and Turkish borders. An American university in that city completes the deployment. But the EU has also its unique qualities. Cofinancing big investments. Giving a hand in education. "The soft dorces will prevail in the end", said a great Dutch poet once. Bulgaria needs fast trains, reliable motorways, a thriving agriculture. The EU can give that. And more. It is a vision, a global vision, that is not present. Even if it is reasonable, to keep one's distances with the actual new Bulgarian government, because of it's populism, it should be deemed good policy to encourage the European orientation of Borissov and give him, as long as possible, the benefit of the doubt. In my experience, local projects that engage local actors, and represent a genuine mutual confidence, will do a great part of the job. That is how the "soft forces" will win.